The house wrens have been busy feeding their young. We still haven't been able to spot one, but we are happy to know they are being well cared for. Once, we saw both parents approach the nest. After one fed, the other transferred its insect to its mate so the mate could finish feeding. Our cat is a little less happy. Although he's an indoor cat, we let him go out on the deck. 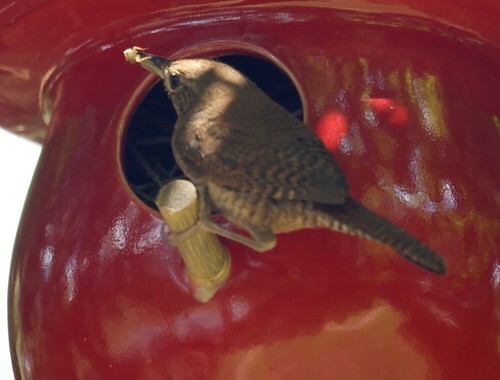 One day, a wren was on the railing scolding him for being out.